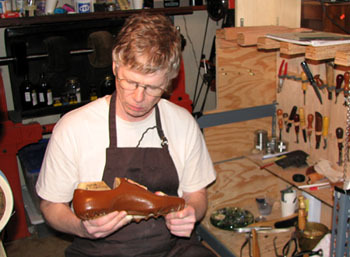 Romango Shoes is a sole proprietorship of Rick Roman, who after years of work as a chemist and then a computer programmer, switched to the traditional art of creating handmade shoes. Rick is also active with tango and yoga and teaches classes in both disciplines. "Romango" is a combination of Rick's last name and tango. Rick has created an open-source "pattern generator" for use by other shoemakers, which is available on sourceforge.net. More information is avaliable here.